You can also read more about the foster dogs and what they are up to in our twice yearly newsletters. STANLEY (previously known as Sam) came into Rescue through no fault of his own, as his previous owner was diagnosed with terminal cancer and felt it only fair to re-home him through Rescue before he became too ill to control where he was placed after his death. He was originally placed in a temporary foster home while a long-term home could be found for him, but, as so often happens the couple who took him could not part with him ... yes, they became "failed fosterers" and have kept him on a long-term fostering basis. Stanley was 10 years old when he came into rescue, a lovely gentleman with a sweet temperament who got on very well with another elderly Collie, Jazz. One year on and Stanley is still going strong. In September, 2016 he did a three mile sponsored walk with his dad to raise funds for Collie Rescue and thoroughly enjoyed himself ... he appeared fitter than his dad the next day too !! Although a little overweight he enjoys his daily walks, but not so much if it is raining as he is made to wear a "doggy coat" which he is not impressed with, but loves the sunshine and spends most of his day, laying in the garden watching the world go by. He also spends time at the family caravan and enjoys the feel of sand between his paws, but not so impressed with the sea !! Meet Fudge, who came into Rescue at the end of 2013. 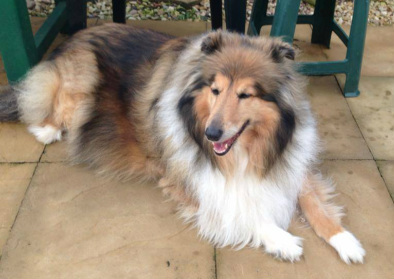 Fudge now lives with Sheila and Dave Payne in Norfolk with their four other Rough Collies. After an appeal by Sheila on Facebook and Collielife.com, we raised a massive £1005 towards Fudge's ongoing treatment. In addition Loraine Hannah of Strobroy Collies donated a silver bracelet which was auctioned on Facebook and raised an additional £120. 17th January 2014 - 'Sir Fudge' (as Sheila calls him) has had his follow up dental check today, and due to the arthritis in his right hip and front paws, he will be on medication for the rest of his life at a cost of £40 per month. The total veterinary bill for all treatment so far is almost £600. GRACEY was 7 years old when she came into rescue in March, 2013 due to her owners' circumstances changing. She went to her new foster home and settled in very well. Oakley, another rescue dog from Somerset came to our attention and we straight away thought about homing him with Gracey and her family. It was love at first sight and everything was wonderful for a while, until Oakley became very ill very quickly in December, 2013 and sadly he was put to sleep shortly afterwards, just before Christmas. Unfortunately for Gracey her foster carers were no longer able to care for her, so she found herself again looking for a new home. She is now a long term resident with one of our committee members and her family of dogs where she has settled very well and fits in with the pack as if she has always been there. Gracey has epilepsy and needs daily medication for the rest of her life to control it. She is on Epiphen twice daily and Libromide once daily, she has regular blood tests to ensure good liver and kidney function. She also suffers from a limp and osteo-arthritis due to a broken front leg when she was young and which was not treated by a vet at the time. Gracey has a wonderful temperament, but sadly her weight has been allowed to get way out of control, weighing a hefty 35kgs. The aim is to get this down to 25kgs with a well balanced diet and exercise. She will attend regular "weigh-in's" at the vets to keep a check on her as the excess weight is having a detrimental effect on her epilepsy and arthritis. Things will come right for Gracey and she will have a long and happy life, safe in the knowledge that she is loved and well cared for. Bonnie-Prince, aged approximately 4 years, we believe, and blind was taken into the dog pound in Ireland by his owner and promptly dumped there without a backward glance. He was placed in temporary foster care and contact made with us about bringing him over to England and re-homing him. He was in a dreadful state, having concrete hanging from his neck and his coat all matted. He was placed in temporary foster care where he was cleaned up until a place could be found for him on the ferry over to England. In the meantime we went about finding the perfect home for him. After a few telephone calls we found one in Chesterfield, Derbyshire. He travelled, along with various other dogs, on the 18th May, 2013 and arrived on our shores at the unearthly time of 3 a.m. where his new owners were waiting for him. 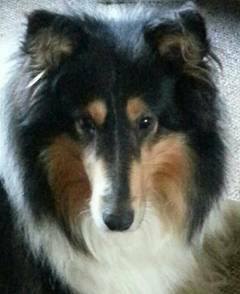 Although initially very frightened and timid, he settled well with their other Rough Collie, Ailee (now at Rainbow Bridge) and after a veterinary check and a complete strip of his matted coat, he seemed to come alive. KARA - came into rescue through no fault of her own. She had lived her life happily with her owner in an old person's care home, but when this was sold the new owners had a "no dog's allowed" policy so Kara found herself homeless. Her owner suffered with dementia so was not really aware that Kara had gone as the staff at the home generally looked after her. We found a home for Kara virtually straight away local to where she had always lived, with a couple who already had an elderly, entire, tri-colour boy called Claude. Kara moved in and settled well. We were told that she was spayed ... well, a fortnight after re-homing Kara had a season ... as you can imagine all hell broke loose and Claude suddenly became young again !! Of course, they had to be separated and quick. We tried putting Claude into temporary foster care but he did not settle at all so for his own health he had to come home. Fortunately, a local kennels took Kara for the three weeks necessary and her owners visited her regularly. She was fine and arrived back home three weeks later to everyone's delight. As soon as it was possible Kara was spayed and while she was under anaesthetic had her teeth cleaned, recovered well and is now enjoying her life. JAZZ - aged nearly 10 years, is another boy who came into rescue through no fault of his own. He had lived his life happily with five other Rough Collies and their owners in the North-West of the country. Unfortunately, the wife and main carer died after a short illness and the family decided that they had to find good new homes for the collies. After losing Claude, we immediately thought of his owners as a suitable home for Jazz as he was an entire male and Kara had, we knew now, been spayed. Arrangements were made and Jazz was collected and taken to his new home down South in January, 2014. He settled very well, making a big fuss of Kara, who wasn't so keen on his advances and told him so, to which he accepted this and they are now the best of buddies, although Kara is certainly in charge !! A veterinary check gave him a clean bill of health, no arthritis, no visual problems, but some dental work needed as his teeth had quite a bit of tartar on them and the gums were beginning to show signs of inflammation. This dental clean-up with be done shortly. Although "under Kara's paw" to begin with, after a week he is beginning to "find his paws" and sneaking onto Kara's sofa and chair when she is not looking. They get on very well together, and love nothing more than going for long walks in the park, playing in the house and garden and of course. lots and lots of cuddles. Dusty, in the background and Jude had been placed in kennels in Edinburgh after their owner became too ill to look after them, she subsequently died and both dogs were signed over to rescue. They were moved to the west of Scotland to a Collie Rescue committee member's kennels. Although very much loved until this tragedy, they had not been groomed for a while so some major work was undertaken to sort out their coats. Rescue agreed that both dogs needed to be re-homed together so a search for the right foster home started. Luck was on their side and a new home was found with a new mum and dad who lived on the Western Isles. They had a border collie called Islay (left) who taught them lots of new games, both good and bad. They are very settled now and go for regular walks on the beach, play football in the garden and generally find plenty to amuse themselves. They also go on long holidays in the motor home, touring all over the country. Dusty has very bent wrists and she had very sore callouses when she first came into rescue. Mum and Dad bought her some bright red protection boots and she looked so odd that Islay and I had to have a chuckle ! Her sores healed quickly with the help of the boots, and she now no longer needs them, much to Dusty's disgust as she thought they made her stand out from the crowd ! Sadly, Islay died aged nearly 18, but there is a new boy on the block by the name of Bowmore who we both adore. He is adopted. 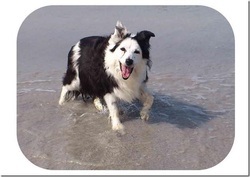 Collie Rescue pay for all our veterinary needs as we are both now 13 years of age. Dusty is really showing her age, she has arthritis in her hips and needs regular medication for that as well as sitting down at every opportunity when on our regular walks, and Jude suffers from cataracts in both eyes so is also on medication and eye drops. Although both dogs have age related illnesses they still manage to get out and about each day and are enjoying their lives to the full.